Official Google reports state that 97% of all Internet searches in Montenegro are done through Google. Your potential customers are already using Google to find the solutions and services they need, and by advertising on Google Ads, you can make sure that they become your customers. Google advertising has many forms, each of which has a specific purpose and situation it’s best suited for and there are many techniques which can make the campaigns more successful. Currently in Montenegro, the best ROI can be gained through advertising on the Google Search Network. Google Ads are operating as a Pay Per Click (PPC) system. What is PPC? That is a model through which you only pay when someone clicks on your ad and visits your website. Because your ads are shown only to people who are making searches related to your product or service, your achieve maximum results without wasting the precious budget. That is why Google Ads offer the best ROI compared to other forms of advertising, including the traditional ones like tv, radio ads, billboards etc. Why is it important to start advertising on Google Ads ASAP? 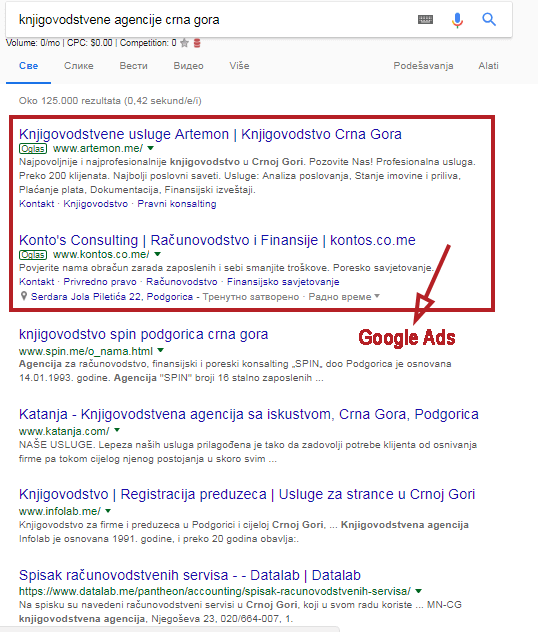 The level of competition for advertising on Google Ads in Montenegro is nowhere near the competition abroad or even in the region, which is why you can still get customers with relatively small budgets. That will not be the case in the future. The reason is the system which Google uses to determine the cost per click. With Google Ads, the cost per click depends on the competition for the given keyword. That means that if, for example, two companies in an industry are advertising on Google for the same keywords, the cost per click will naturally be lower than if 20 companies were fighting for the first page of results for those keywords. As Google Ads become more popular in Montenegro over time, the level of competition will increase along with the cost per click and the total budget needed to achieve the same results.